Frequently Asked Questions - Hydrotech Membrane Corp.
Below are answers to some of the questions that our experts are asked most frequently. If you have additional questions about any of the information you find in this section – or if you have a new question of your own – you can Ask an Expert using the simple form in the right-column to have one of our experts at Hydrotech Membrane Corp. reply to you directly. A majority of plant life functions best when there is ample water and favorable temperatures. However, with the exception of tropical regions, most plants are exposed to dry periods and/or temperatures below freezing for some period of time during the year. Unlike animals, plants do not have the ability to add insulation through fat stores or a winter coat, nor do they have the ability to relocate. Instead, plants go through a period of dormancy. Dormancy is a state in which plants exhibit little or no growth and in which most, if not all metabolic activity ceases for a period of time. It is typically triggered by cooler weather and a reduction in sunlight, but also can be brought on by stress due to heat or drought. These changes in climate are nature’s mechanisms to inform the plants that they need to start shutting down for the upcoming winter months. The plant goes into dormancy at this time because it can no longer make enough food from photosynthesis to support active growth. Nearly all plants in temperate regions go dormant in winter, including those on your Garden Roof. Most deciduous plants, including some sedums, shrubs, and trees, lose their leaves in preparation for dormancy, in order to protect themselves against upcoming damaging weather conditions. With the onset of freezing temperatures, deciduous plants must protect themselves against water freezing and then rupturing their cells. Evergreen plants also go dormant, but less conspicuously than their deciduous counterparts. While evergreen trees and shrubs do not grow, pollinate, or produce seeds during dormancy, they retain their leaves or needles. This holds true for some species of evergreen sedums, which will hold onto their foliage, but typically take on an orange or reddish color during dormancy. The onset of dormancy emphasizes the importance of ensuring plants are properly established and healthy heading into the winter months. Ideally, plants within newly installed landscapes have the opportunity to get established for at least a few weeks, and uptake water into their roots and stems and (evergreen) leaves part of their normal processes. This water will prevent the plants from drying out during dormancy. If plants do not have the opportunity to establish and uptake water, they will dry out and are then susceptible to desiccation or winter burn. Although dormancy can be considered a quiet time for your Garden Roof, many plants provide winter interest throughout the winter months. Evergreen sedums turn orange, red, and brown, ornamental grasses provide color and texture, and woody plants even without their leaves, can provide structure. A plants dormant state and how it can contribute to the aesthetic of your project should be considered when designing your Garden Roof. Dormancy will come to an end in spring, the weather starts to warm and the days get longer, and plants can resume their normal processes. Spring is typically a great time to check nutrient levels within the media, which should be amended as necessary based on the type of plantings. This will ensure plants have all the vital nutrients for a successful growing season. Have a question of your own? Ask an expert by using the short form to the right. Are Garden Roofs really "no maintenance"? There is no such thing as a no-maintenance vegetative roof. 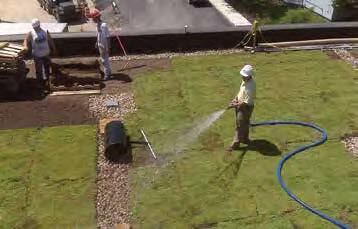 Hydrotech highly recommends that a maintenance contract be in place on all vegetative roofs. Maintenance is critical during the establishment period to help ensure the long term success of a project. The amount of maintenance needed on vegetative roofs taper down as the plant material becomes more established and mature. Vegetative roofs cannot perform as intended without maintenance. Aside from the thrive and coverage warranty that Hydrotech can provide if we supply the vegetation, there are additional reasons Hydrotech strongly recommends maintenance. Below are key points that need to be considered. Vegetative roofs are a significant investment. Maintenance is a relatively small cost to protect this investment. Keeping a watchful eye on the roof will maximize plant health, maintain the aesthetics of the roof, and ensure any systems such as drains, parapets, vegetation free zones and irrigation systems are performing as designed. Healthy plants transpire water which is an essential function on vegetative roofs to manage stormwater, keep the roof cool and help mitigate the urban heat island effect. If the vegetative roof is not maintained invasive weeds can take over a roof. This not only can lead to an unsightly roof but the specified plant material could completely die out and be taken over by invasive species. Some invasive species have aggressive root systems which could potentially compromise the waterproofing membrane. Please contact Hydrotech's Garden Roof Department for additonal information about best maintenance practices. Stress signs for your extensive Garden Roof: What to look for? Its summer, and in many parts of the country that means hot and dry weather, which can be the most stressful part of the year for your Garden Roof. There are a number of signs which can help you gauge the stress level of the vegetation on the roof. If you know what to look for, you can take the proper steps to resolve the issues before the roof sustains long term damage. WILTING VEGETATION – If the plantings are still getting established, wilting vegetation can mean the roof is receiving too much or too little water. Irrigation settings should be regularly checked, and adjusted accordingly. RECEDING VEGETATION – Many extensive plants, whether they be sedums, perennials, or native grasses have a tendency to recede when stressed. Though some this is normal for some species during times of stress, if left unchecked it can be fatal for plants on the roof. Extensive vegetation, whose media substrate can be thinner, and thus dry out more quickly and become warmer, and have a disadvantage to their at-grade counterparts. BURNT or SINGED VEGETATION – This often occurs either at the perimeters of the roof where vegetation directly adjacent to hardscape - which can carry a higher temperature, or the result of reflective light. If possible, irrigation should be increased in these areas to offset some of the heat. If the area remains an issue, measures should be taken to incorporate vegetation free zones (with cooler temperatures) for the problematic areas. EXPOSED MEDIA – Areas on the roof may have exposed media because the roof has not yet established, or in the summer and fall months, because the plants have receded or migrated on the roof. While exposed media itself is not particularly damaging, it can lead to pressure from weeds. It is important to keep the roof weed free, and remove any weeds as soon as possible. DRY MEDIA – Areas throughout the roof should be checked for moisture. If there is no dampness to the media, irrigation should be increased. Irrigation settings will vary due to region and plant material. What is the weight of a Garden Roof? It depends on the type of assembly and the depth of the soil. Saturated Extensive Garden Roofs can range from 110 to 215 kg/m2 (22-45 pounds/SF).Saturated Semi-Intensive Garden roofs range from 170 to 440 kg/m2 (35-90 pounds/SF), and saturated Intensive Garden Roofs can be anywhere from 170 kg/m2 (35 pounds/SF) up to whatever weight the structure can safely hold. Weights will vary by region and design intent. What are my surfacing options? For typical Protected Membrane Roof (PMR) applications, STYROFOAM™ insulation may be surfaced with stone ballast, architecturally finished concrete paver, a concrete topping slab, or our Garden Roof® components. What size can the paver achieve if considering center spacing? A 610 mm X 610 mm X 45 mm square paver, when installed with any of Hydrotech’s accessories (4.7 mm spacing) will equal 614.7 mm on center. What is the minimum slope required for Monolithic Membrane 6125®? Technically, Monolithic Membrane 6125® does not require the deck to be sloped. As a monolithically applied material that has no seam, the membrane is designed to be in fully submerged conditions indefinitely and be fully guaranteed for watertightness. Water access at the roof level is an important design consideration that is often forgotten or an afterthought in the vegetated roof design process. Access to sufficient water is one of the most important considerations for establishing and maintaining healthy vegetated roofs. After the establishment period, most extensive vegetated roofs can rely predominantly on natural rainfall with occasional supplemental watering needed when natural rainfall amounts fall short. Manual irrigation systems consist of hoses and nozzles that apply water to the media and plant material. Very labor intensive, manual irrigation requires the commitment of labor resources to be on the green roof on a very regular basis. Temporary irrigation systems typically consist of hoses and sprinklers connected to on-roof water sources such as hose bibs or roof hydrants. These systems are typically used during the establishment period and removed soon after. 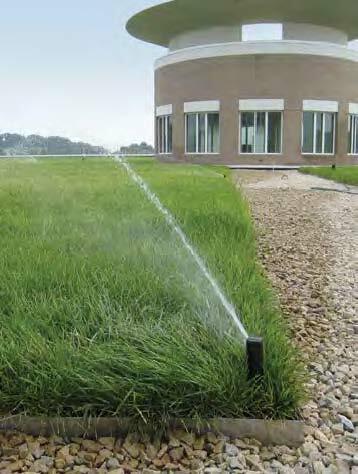 These systems require significant labor hours during the establishment period to move and re-set sprinklers to ensure proper coverages over the green roof. Portable irrigation control units are available to create a semi-automatic system that helps to reduce the labor costs of turning on and off the irrigation system. Newly installed plant materials require large and consistent amounts of water during the initial establishment periods. Drip irrigation systems cannot deliver enough lateral water to the top of the media immediately adjacent to the root zone of sedum tiles and carpets at time of installation. As a result, drip irrigation systems can be used, but will require additional supplemental irrigation equipment and labor to provide enough overhead water for proper plant establishment. Pop-up irrigation systems can more effectively simulate natural rainfall and apply water to the top surface of the media where the water is more available to the plants. Pop-up irrigation systems can provide water during both establishment and ongoing maintenance periods. Pop-up irrigation systems (properly designed) do not require supplemental systems to provide sufficient water. Pop-up irrigation systems must be properly designed to keep overspray to a minimum. Sprinkler head selection and patterns are crucial to a properly designed system. For proper design and operation, a qualified irrigation designer/consultant should be consulted when designing any irrigation system. A qualified irrigation designer/consultant should include a thorough maintenance plan as part of a properly designed irrigation system. Having sufficient water is a very important part of creating successful vegetated roofs. The water needs are especially important during the installation and initial maintenance stages of the project. Water needs can vary dependent on local climate patterns, plant material types and owner expectations. The choices of whether to use manual or temporary irrigation or to invest in either drip or pop-up spray irrigation systems involve many different issues. Ultimately, the choice of system is up to the building owner. Hydrotech is available to assist owners, designers and contractors by providing perspective and input on experiences with the green roofs that it has constructed. What vegetation option is right for your Extensive Garden Roof? Vegetation selection requires understanding a wide range of factors, including microclimates, which could ultimately affect the success of a vegetated roof project. 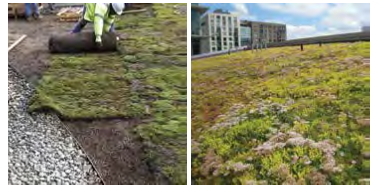 Hydrotech has 20 years’ experience on vegetated roofs all across the country and can assist in vegetation selection for your project based on your design intent. 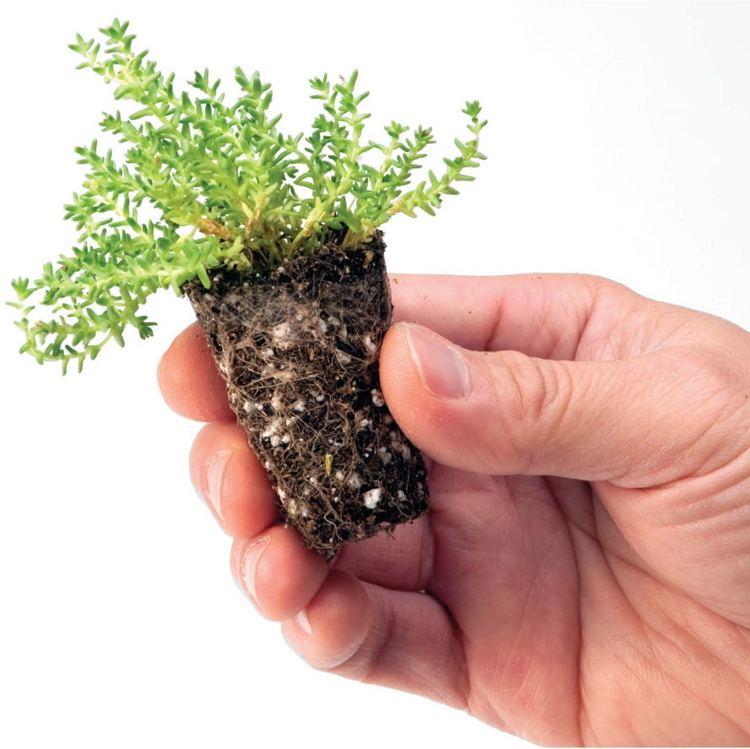 Hydrotech offers a wide variety of extensive plants including perennials as plugs and sedums in several formats including cuttings, plugs, and pre-vegetated InstaGreen® Sedum Carpets and InstaGreen® Sedum Tiles. Each planting method allows for various degrees of design flexibility and coverage rates. Each method has particular requirements for establishment and maintenance. Hydrotech offers city specific plant lists which can be used as a great starting point for your vegetation selection. These lists include natives, grasses and succulents appropriate for your projects location. Cuttings from sedum plants can provide a very effective and economical vegetative roof. Blends of cuttings can provide a wide array of textures and flower colors for the vegetative roof. Custom grown plugs of a wide range of sedums, natives, grasses and other perennials are also available. Plugs can give the designer nearly unlimited freedom to create swaths of color and texture on the roof. 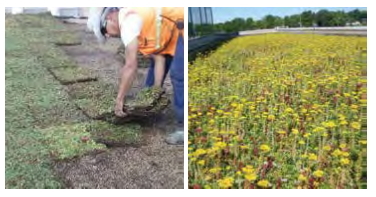 For a vegetated roof that is completely green once completed, Hydrotech offers InstaGreen® Sedum Carpet. Provided in approximately 4' x 6' (25 S.F.) rolls that are laid out onto the prepared media like sod, Sedum Carpet has a range of sedums that provide nearly complete coverage on Day 1 of the vegetative roof. Using sedum carpet can greatly decrease installation time and maintenance. 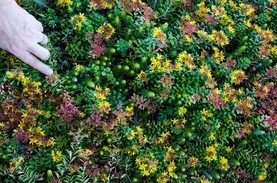 In another format that creates an instantly green roof, Hydrotech offers InstaGreen® Sedum Tiles. Created in a 15" x 20" (2 S.F.) tile format, Sedum Tiles are available in four standard blends to address most roof top conditions, Sedum Tile is also available in custom blends. 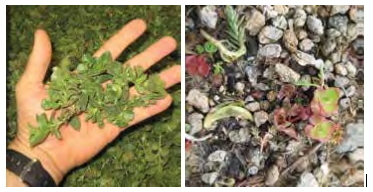 In some northern parts of the country most sedum are not a viable option. While most sedum is not recommended for the north, there are many types of natives, grasses and perennials that can be used to vegetate your Garden Roof. Please contact Hydrotech for specifics.